She's beautiful, talented, intelligent and has now launched her very own campaign. 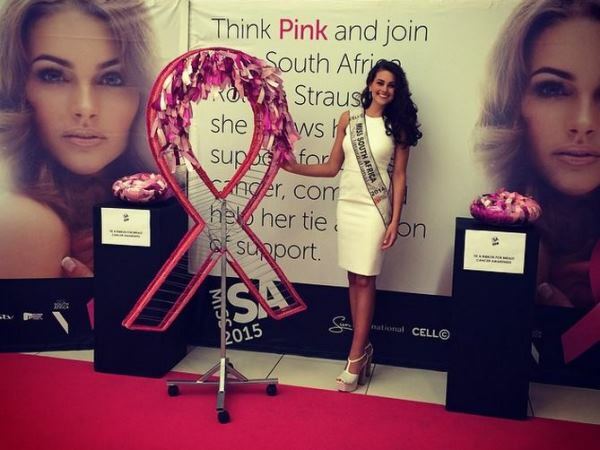 Reigning Miss South Africa, Rolene Strauss, is adding hope and colour to Sandton City as she recently launched her very own breast cancer awareness campaign with the unveiling of a giant wire exhibit. The fourth year medical student hopes that this will draw attention to the issues surrounding breast cancer and shoppers will be asked to support the cause by tying a pink ribbon to the work. Studying within the medical field, despite having to put this on hold during her reign, breast cancer is a subject that Rolene feels strongly about. “As a young woman who is passionate about health and women, I feel that by creating awareness around breast cancer, I am putting the ball back in the women's court. You can reduce your risks of getting breast cancer while early detection means a much greater chance of winning the battle against the disease," she says. She says that it is important for woman to ensure that they have regular mammograms and sonars, maintaining a healthy lifestyle and diet to help in the reduction of the risks of getting cancer. October is breast cancer awareness month and Rolene's large metal exhibit of the pink cancer ribbon will be on view outside Stuttafords, on the upper level, for people to tie a pink ribbon. It will be there until October 29.